I recently made this recipe for my online gourmet butcher client Butcherman for their monthly email newsletter. It’s always such a joy to cook with their delicious meat. As you can see, the lamb was very juicy and it went really well with the Moroccan flavours in the couscous. I have to admit that I didn’t make the couscous in the traditional way (like I learnt at that excellent cooking course in Morocco) as my brief was to make something quick to throw together while the lamb cooked on the BBQ. Never-the-less it’s a great combination of flavours and is super simple to make. Just like 99% of my recipes here on Fig & Cherry! If you’re not a lamb lover then the couscous also goes really well with fish or prawns thanks to the tangy preserved lemon kick and fresh herbs. 1. In a large non-metallic bowl whisk together the vegetable oil, crushed garlic, chilli flakes and pepper until well combined. Add the lamb backstraps and coat in the mixture, massaging gently so the flavours penetrate the meat. Cover and marinate in the fridge for 1 hour. 2. Place the couscous in a medium saucepan and add the stock or boiling water, olive oil and a pinch of salt. Stir, cover with a lid and leave for 5 minutes (not on the stove) until the liquid has all been absorbed. 3. Bring the lamb to room temperature and pan fry or BBQ for 4 minutes on each side for medium or until cooked to your liking. Rest and keep warm under a tent of foil. Fluff up the couscous with a fork and mix through the parsley, olives and preserved lemon (or zest). 4. Thickly slice the lamb and serve with the couscous and lemon wedges. I love lamb backstrap, I think it is amazing how a cut of meat with next to no fat can be so buttery if cooked well & well rested. I’d been searching on foodblogsearch.com all day for green olive couscous after trying it for the first time at Estia in Philadelphia this weekend. And of course, you’d have it! I read your blog so regularly – I shall remember for next time to check here first. Love lamb in all dishes! Delish with the cous cous Christie. As usual, your simplicity in preparing this is the winner. 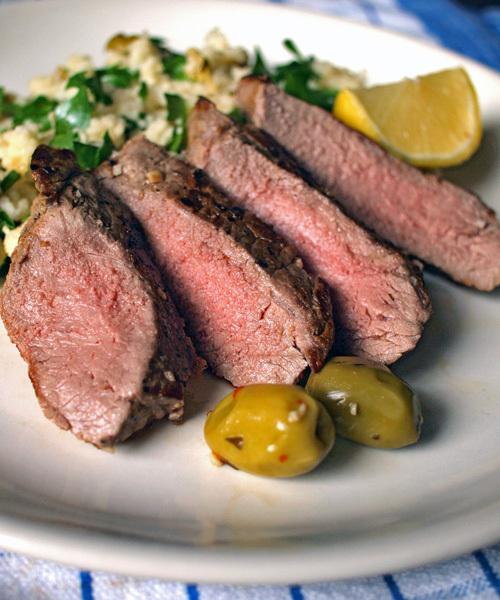 I eat lamb all the time but never had it with olives — I’ll give it a try! I love the look of that lamb! Even when I think I am finally going to make it to the other side(vegetarianism), I slip on a pic like this one! Can’t think of a better combo than lamb and couscous! Yum! Lamb is gorgeous when cooked well. Olives are perfect with anything in my book. What a perfect dish. What a beautiful dish! The lamb looks like perfection itself! Gorgeous! !